joel dirt: NAHBS in Richmond this weekend! NAHBS in Richmond this weekend! 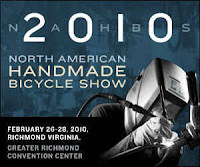 ....the National Hand-made Bicycle Show will be in Richmond this weekend. I'll be doing some volunteer helping in the merchandise booth on Saturday from 1-6pm. So if you're looking for a t-shirt or some swag, come see me! Hopefully, I don't get too tempted to drain my bank account on a custom frame....there should be some beautiful frames on display...our own locals Tektonics and Cycles Ed will also be at the show, so come on out!